June | 2011 | And mightymouse pronounced . . . . You Must Create! Ooh so Harxest made this cool video of the Dr Sketchy ‘Sylivia Ji’ themed life drawing class I went to last Sunday – held at Outre Gallery, Melbourne. Was a great afternoon – The models were stunning! 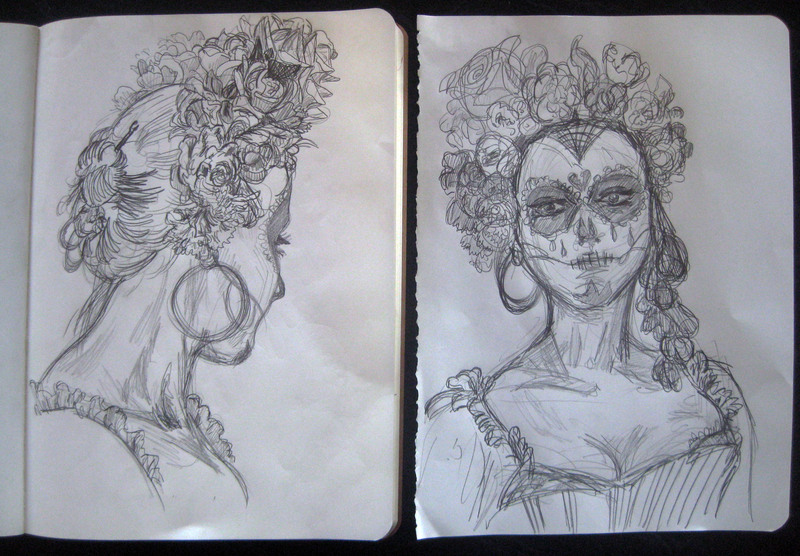 I spent my Sunday afternoon down at Outre Gallery on Elizabeth st sketching these gorgeous girls. Outre collaborated with Dr Sketchy’s, Melbourne to put on a special Art Star event in celebration of their latest show Ofrendas – Amazing prints and new paintings by American artist Sylvia Ji. 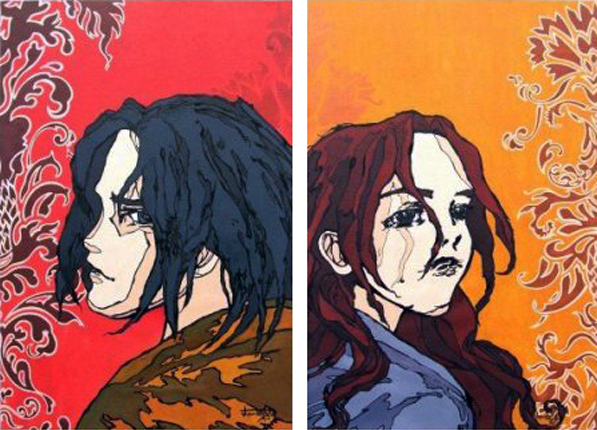 Silvia’s paintings feature mysterious girls in rich colours and dramatic Dia de los Muertos decoration. Our models Vespa and Camilla were decked out in extravagant day of the dead costumes and feather headdresses to compliment her work. Seeing as I haven’t actually been to a live drawing class since first year fashion design 8 or 9 years ago, I’m pretty pleased with how my drawings turned out… In fact I even won a copy of Angelique Houtkamp’s Tattoo Darling with the top left sketch as Camillas pick of the night. It makes me wanna find a bit of time to see what these girls would look like painted up in gouache and ink – the colours and patterns combined were just stunning. Thanks Outre and Melanie of Dr Sketchy’s for putting this cool afternoon on! I have finally finished the second native bush panel that has been in progress for what seems like ages now. This time featuring both Riroriro *Grey warbler* and Tui. The time lapse is due to a few things… Being sidetracked with a couple of wonderful commission pieces, and also with my Tui’s lack of sleep last week now that she can climb out of her cot. This week however things are looking up – The novelty has worn off and there has been an afternoon sleep every day. Its allowed me to finish second said commission piece. Having my two hours in the afternoon to paint back… So good! 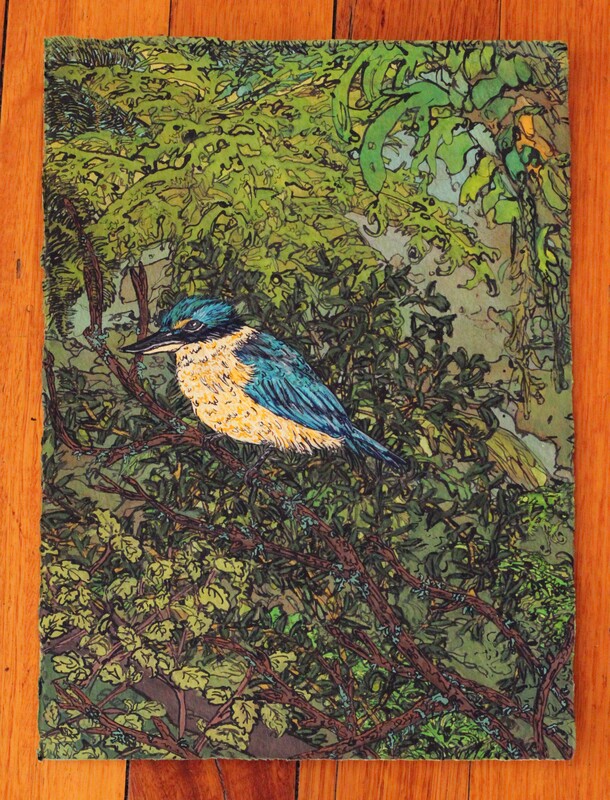 The first bush panel featured one of my Kotare – The New Zealand sacred Kingfisher. The battery off D’s flash camera was flat today, so I had to photograph w my iphone instead… Promise to put up clearer pics as soon as its charged tomorrow. 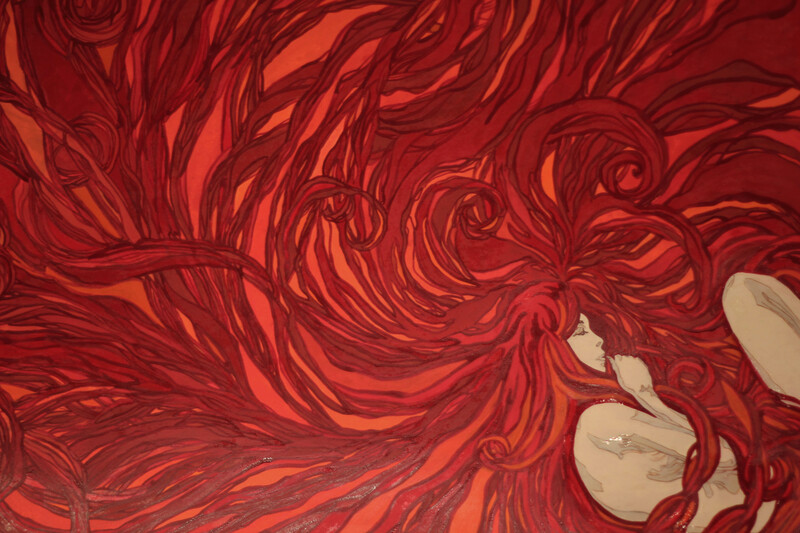 I had a request from a friend for my Anemone girl in shades of red and orange, and on a slightly larger scale than the original A4. So here is a variation on her at 56x38cm, and with added detailing… I might have got slightly more carried away with this than planned! You can see the original Anemone is this previous post here. Goodbye old friends, you will be missed…. 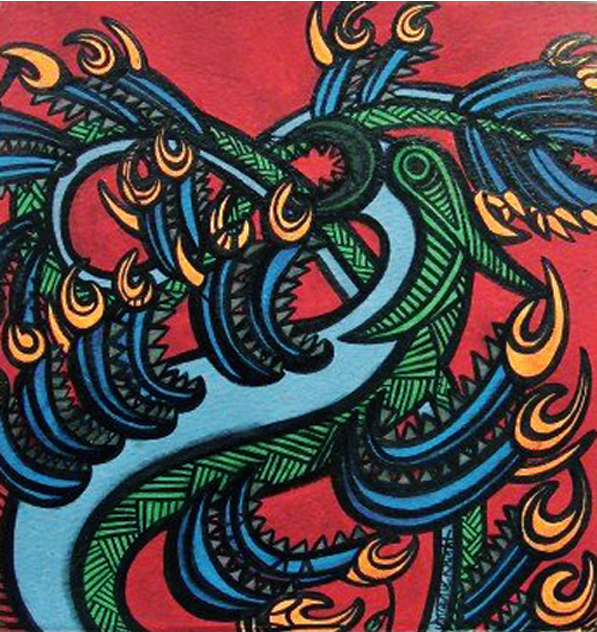 When someone gives you an artwork its not just some bit of paper with some paint… Its an idea that may have been thought about for quite some time, that has gone through multiple mutations in its rough form. Its hours and hours – Often days and weeks worth of work to get it to that finished state. I’ve come to place a higher value on my work and time than I used to, so now I don’t give so much away. And when I do, Its often for something really important like a wedding. Gifted artwork should always be appreciated and valued – It’s worth thinking about if you are ever end up with a present like this. Because if you dont, If you are someone who chooses pass it on in favour of some tacky trademe buy, you may just find you will never be given something with this much love in it again. For you, I would much rather grab a mass produced, store-bought itunes voucher. 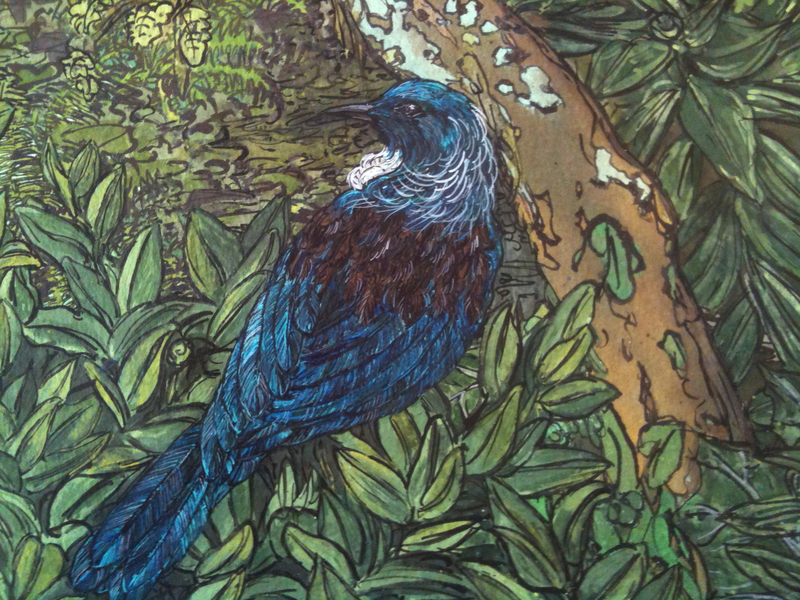 And here is the last of the Kotare set *for now* that I’ve been working on – It’s taken me a bit this week to get it done… Tui has dropped her daytime sleep, so the only painting time I now have is in the evening, If I’m not too exhausted. So next I get to focus on getting another almost-finished commission piece done, done and sent, and then I’ll let myself start on a new idea thats been in my head for a week or so. Exciting! 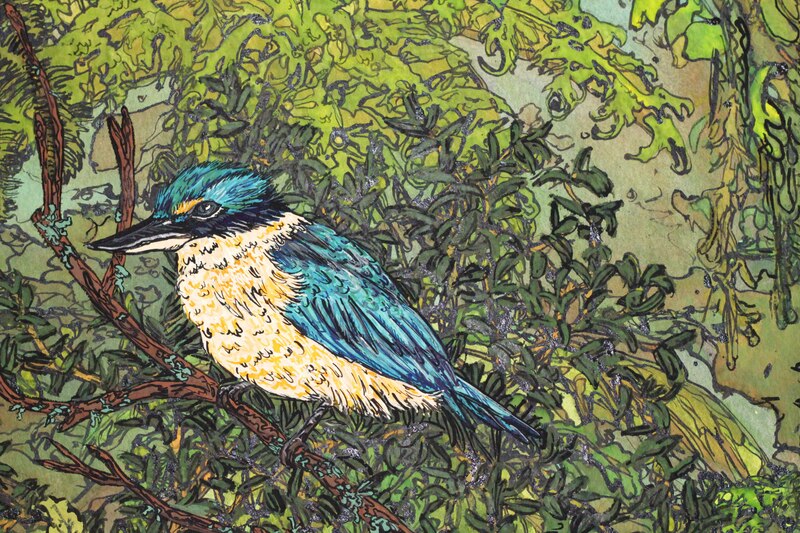 I’m quite pleased with how this series of Sacred Kingfisher has progressed over the week. Here is the latest offering in a native New Zealand bush scene. I think it may be my favourite and my best yet! Here is a close up of the Kotare… They have been such a pleasure to paint in their pretty colours – If you click on the image, It’ll give you a bigger pic to view.